We spent the evening with some friends last night. One of these friends, JR, is amazing with kids; he took our boys for the day when we needed to get a new car last summer and Mal was excited to get to see him all day yesterday. When we were done eating, JR offered to take Mal to look for dead crabs at the beach (it's been an obsession of Mal's since last summer when they saw some on the beach while we were buying the car; he often talks about how he's going to eat dead crabs with JR). And then it turned from just Mal to taking all of the kids and taking the all in the rain at that. I wish I'd caught a picture of Mal when he got back. Wet curls, in a jacket a size or two too big for him (it'd been nice out when we left the house, so he borrowed one). He was quite possibly the proudest, happiest little Mal I've ever seen as he ran in, holding a plastic bag, and saying "I found a dead crab!!" It was seriously adorable. Don't worry, we made sure the out of the bag experience was brief. And that he washed his hands after putting the crab back in the bag. He was convinced that we could cook and eat the crab, but all the adults managed to get through to him eventually that doing so could make us sick. And I made sure to quickly shut down any ideas of the crab being carried into bed with him. 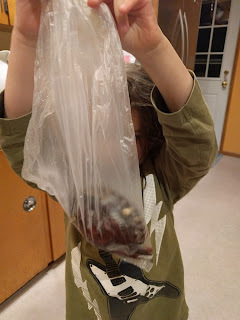 He was convinced though that we could store the crab in our fridge. 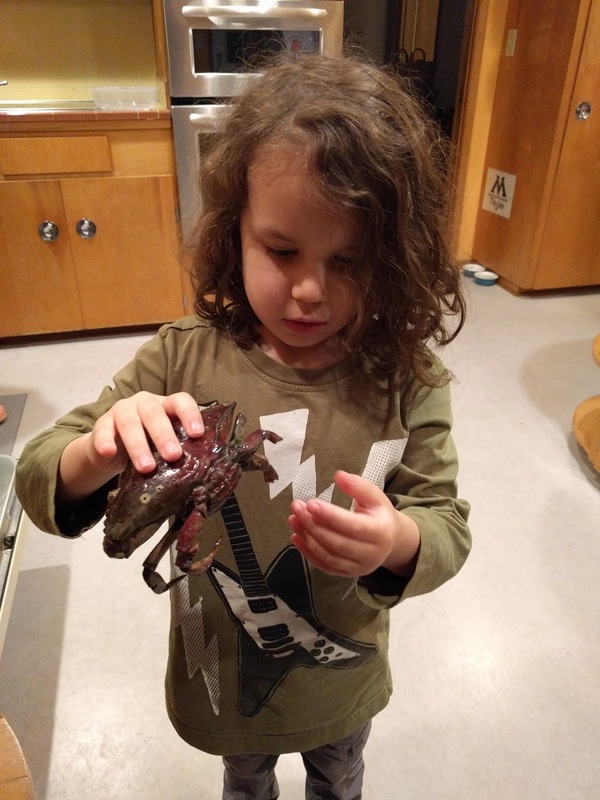 Thankfully, by the time we got home he was so tired he didn't notice that we didn't bring the crab in the house. And this morning when he asked about it I just told him it started getting really smelly, so we'd had to throw it away, which he thankfully seemed to accept.